It's time for transparent risk management. Manage your risks, your controls and all relevant data you need to assure proper and transparent risk management. Managing all relevant information for transparent risk management efficiently. Not only the data like laws, objectives, processes, RACI, risks, controls but also their relationships easy to maintain and transparent. Document your control framework and bring it to live with event management to identify issues and start improvement. Manage the progress and monitor the status of your remediation. 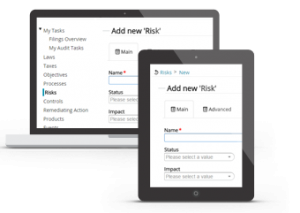 Allways up to date view on your risk and control framework, for you and your supervisors. Monitor your business events and the progress made to avoid them from happening in the future. Be in control. Create risk and compliance awareness in the organization and work together to show that you are in control. Finally an application that is cost effective yet complete!